In our absence, please see the recent eBird reports for area sightings. NOTE: These may or may not have been reviewed by regional editors! Take these reports with a grain of salt, as typos and misidentification can occur. "I was there about a month ago and they wouldn't let you drive the road down to the wetlands. Apparently you have to use a scope from the highway. There is a dirt dike that you can get a little closer on." If you are working on a Century Club list for Presidio County, this is certainly a place that can't be missed. To my knowledge it is the only publically accessible wetland in the county. I was at the BJ Bishop wetland in mid-August and again on October 30. The RV Park Manager, Donna Arce, is very friendly, and very interested in the birds that are visiting the wetland. You might be able to sweet talk her into accompanying you down closer to the wetland on the gravel road that Mark Lockwood mentions, but my experience is the same as Carolyn's concerning trespassing. Eventually the owners of the wetland plan to build a bird blind up by the Ranch Road, but it sure would be nice to have it be closer to the wetland. Maybe a more local birder could persuade them? Nice birds on October 30 were 2 White-faced Ibis, a Long-billed Dowitcher and ducks. and Brewer's Sparrow very cooperative. Ultimately, I need to check my pre-sorted emails more frequently: this information is nearly a month old (posting date is 23 Sept, but this will be backdated for the archives). These are from Sue Heath's posts from 28 and 29 Aug, 2015. Found a white-eared hummingbird along the boot spring trail in Brewster county this morning. It was past the buildings but before the juniper canyon trail goes left. It was defending a large patch of flowers against a black-chinned hummer and a blue-throated hummingbird. Appeared to be a female or young bird as it had no gorget feathers. I posted a full description on ebird. Got some very blurry photos but can't post them til I get better internet. Good birds up there today. Many townsends and Wilson's warblers, one Colima warbler, four or five painted redstarts. Tad thinks he had a buff-breasted flycatcher in the same general area as the white-eared hummer but we could not relocate it so I didn't see the bird. We found three live and one road kill burrowing owls at the marathon prairie dog town along U.S. 385 in Brewster county today. The live ones were near the northern end. There were also eight long-billed curlew which ebird flagged as rare. Also a dead badger that some vultures were investigating. It looked like it got hit by a car and was just able to drag itself about 30 ft out Into the field before expiring. I wish I would see a live one sometime. The dead owl was unfortunately too far gone for a specimen. The only corrections are to obvious phone-typos, many thanks to Sue for the permission to share!! 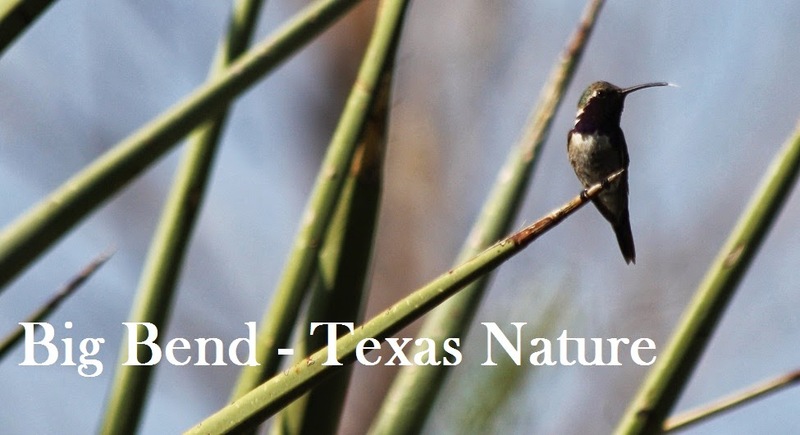 Mary Beth Stowe has allowed us to post her summary from Lake Balmorhea - it's snagged from Texbirds, backdated, and slightly reformatted for the blog but we're grateful for what we can get! I keep saying "we" - the blog is its own entity, I suppose? At any rate, be sure to check out Mary Beth's site: www.miriameaglemon.com, it's a fantastic combination of birding and art and humor and maaaaybe one of these days I'll even get to meet the brains in person! Was on my way to southeast Arizona today, but made a quick stop at Lake Balmorhea first thing. Stopped under the overpass long enough to confirm Cave Swallow and record the Rock Pigeons making a bunch of noise. Got to the lake, stuck my five bucks in the door, and delighted to the calls of both Western and Clark's Grebes and their chicks! And I relished in something else I hadn't experienced since leaving San Diego: the smell of the wet desert! Crawling around to the back side of the lake, a goofy-looking Pyrrhuloxia popped up on a bush, and along the back side of the lake was a nice assortment of water birds: what I'm presuming to be Blue-winged Teal (they were all in eclipse plumage and were quite distant - and of course flew the minute I got the scope out L), a dowitcher, a Greater Yellowlegs, a Great Blue Heron, and even a Black Tern batting by in the distance! Coming around the corner a pair of Scaled Quail were down by the water, and on the west side of the road was another little wetland with several Black-necked Stilts and a couple of Ruddy Ducks. Down at the end of the road a Yellowthroat was singing, and a brilliant Blue Grosbeak sat right up on a mesquite! While enjoying this a night heron, White-faced Ibis, and Green Heron all sounded off somewhere. On the way out a Black-throated Sparrow sang in the distance, and Western Kingbirds were patrolling. I think I mentioned the last time I came out here how much this place reminds me of the fresh-water wetlands near the Salton Sea!